I wonder if the City thought I wouldn’t read the massive amount of emails they sent me. Well, I did. I filed one more FOIA request today for the pictures they posted on the City’s Intranet. Correction: EAC stands for Employee Activities Committee. If the City is short on employees, ending this group will free up a lot of staff time! More fun – the City redacted an Automatic reply. This email would have automatically been sent to anyone who sent Greg Moredock an email. Greg may work for the Springfield Law firm, but have a City email address. Normally they say “I’m out of the office until . . .”, so why is it redacted? Beth Oakley didn’t do any work the day of the Chili cook-off (previous story), looks like Misty didn’t either. Looks like a lot of Department heads/team captains didn’t work much either. They bought tables and decorated them – starting at 9:00 am. He’s got it exactly right! 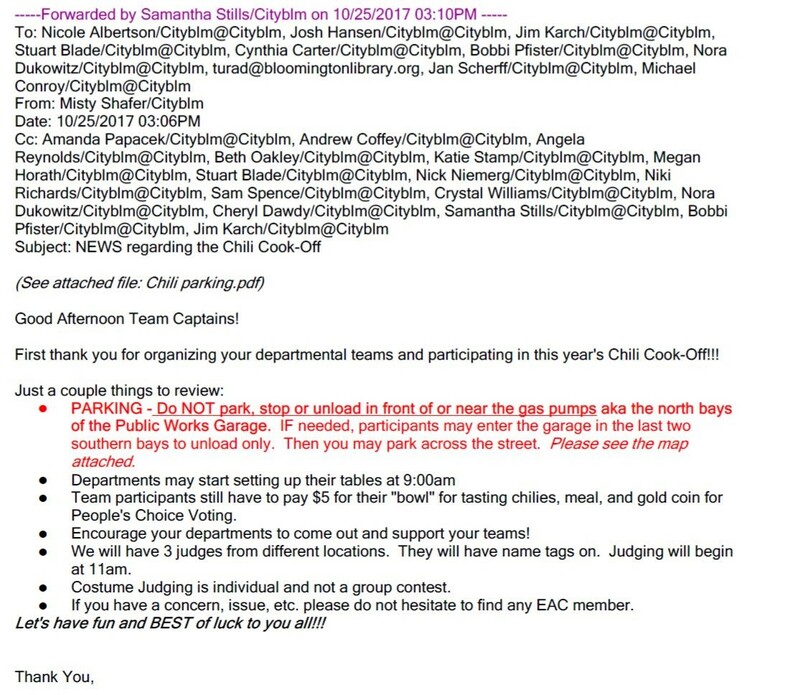 Posted in BloNo, Bloomington, Hales, Local, Renner, Taxes.Tagged chili cook-off, EAC, Employee Activities Committee, FOIA Request, lawsuit. Truth IS stranger then fiction. And we pay these rectums HOW MUCH a year and THEN a good pension, which TARI don’t want to stop, along with the council. THEY ALL MUST GO! BYE, BYE!! I’m pretty sure this isn’t just Bloomington. It happens in government all the time. I know I participated in events like this at ISU on a regular basis. The thing is it stopped being fun for me when I saw my neighbors lining up at food pantries, a homeless student being fired and flunking out, and finally my epiphany in which I realized that I, as an employee was part of the problem that would cause my children to starve. I had to leave to figure it out. Working for the government is its own kind of prison. 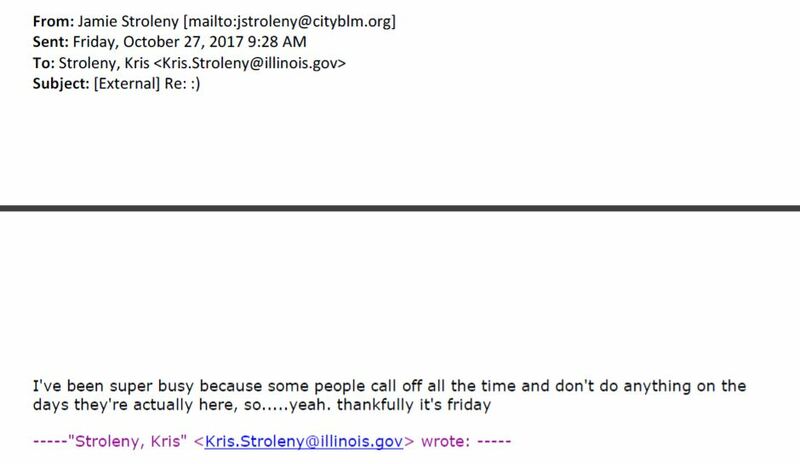 The Stroleny email was to another Stroleny. Was that an email that to a spouse/relative that possibly wasn’t suppose to be seen by others? It was to a outside city govt. email address. I am all for team building and holiday parties but if this is a annual event it should be pretty cookie cutter at this point. It should not require weeks of planning and all the out of offices at tax payer expense. Maybe next year during the party might be a good time for a large number of residents to head down to city hall to ask about their garbage bill or a zoning question maybe. Actually, the parties are great morale builders. And I guarantee the COB isn’t the only entity to do so. State Farm does them, but yet no one complains. State Farm isn’t government. The best morale builder is for City employees to look at jobs elsewhere and see they have better pay, better benefits, and a pension they can’t get anywhere else. Morale at State Farm is cratering, the employee exodus not of their choice is accelerating.